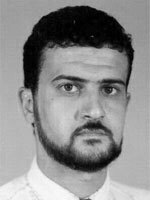 A few days after the Sept. 11 terrorist attacks, Anas al Libi was placed on the FBI’s Most Wanted Terrorist list. The reward – $25 million, the same amount offered for the capture of Osama bin Laden. On Saturday, authorities finally captured al Libi in Libya, accusing him of being one of the top remaining leaders of al Qaeda and a former confidant of bin Laden’s, NBC News reports. Libyan officials are asking for an explanation, NBC News reported. Posted: 10/7/13 at 8:38 AM under FBI, News Story.